We buy MANGOS and fresh CILANTRO quite often in Denmark, but I had honestly not thought about how much they cost in Texas in a while. Maybe I was just blocking it out??? But I was in Walmart on Friday and had one of those "OMG DANISH GROCERS ARE MAKING A BUTTLOAD OF MONEY" moments. 19 Kroner divided by today's exchange rate = THREE DOLLARS & SIXTEEN CENTS. I am not a mathematician, but I am pretty sure that is somewhere between a 4x and 5x markup in DK. UGH. And then Cilantro, a key ingredient to so many of the Tex-Mex dishes I make. 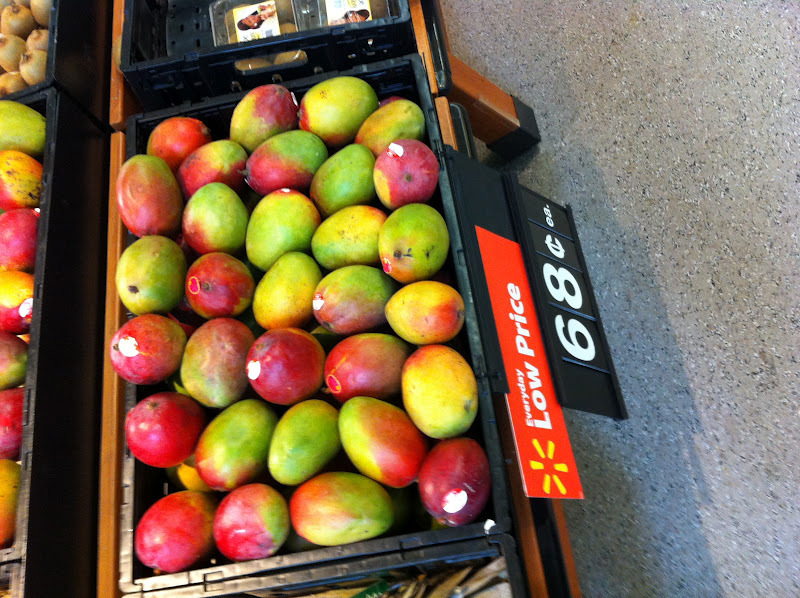 At Walmart, it is 28 CENTS a bunch. Again, I am LUCKY if I can find fresh cilantro in DK on the DAY I actually need it. Mads has been known to drive to 2-3 stores in search of it! I'd say that it is actually at the store 50% of the time I need/want it. And second of it, it costs, on average 16.95dkk, which is TWO DOLLARS & EIGHTY THREE CENTS. Again, not to tout my math skills, but I am QUITE CERTAIN that is a markup of TEN TIMES. Again, UGH. I understand imports and taxes and whatnot. For the mangoes, it probably has to do with the transportation of the fruit as well. I know that when I order goods from abroad, the shipping costs can be a fairly large proportion of my sales price - especially when dealing with heavy or fragile goods. in Denmark, the average negotiated minimum wage is 103.15 kroner per hour - $17 per hour. Still fruits and veggies should be less expensive but that's a political issue since many Danes want tax on healthy foods to be less than non-healthy foods. I bought a cilantro plant (the most usual here) for 29NOK the other day. Nearly five US bucks! Gah, if I think about price comparisons too much I'll go crazy. Thanks Lars for the current wages. It does make a big difference. I haven't entered a Wal-mart in 4 years. Need to know what farm the produce came from and that is is local and organic. I'm with you Kelli! Food prices are insane here! I did find cilantro finally, now that I know it is called Koriander it has become a lot easier. But I was definitely more than a little surprised a the price. The biggest DK price shock I had yet is when I got back from Thailand. I had just gotten used to paying 25 cents for 1.5 liters of bottled water, when I finally got to CPH I has super dehydrated and had to buy a water, which cost me $4 for 500 mls! I know we are mostly paying for convenience and plastic, but come on! How can it be so cheap to bottle water in a place like Cambodia, where you can't even drink out of the tap, and so expensive here, where plenty of clean water flows freely? And why on Earth do we have to pay 28kr for 3/4 of a liter of tap water at a restaurant here? And minimum wage may be $17/hr in DK, but after you pay 50% in taxes, it becomes much closer to the minimum wage in the US.